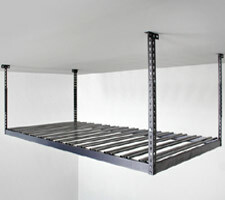 These are excellent overhead storage racks. They can hold up to 800lbs of your gear and can be easily installed in one day! What makes these overhead racks so easy to use is the Enduro-Track that comes standard with every rack. 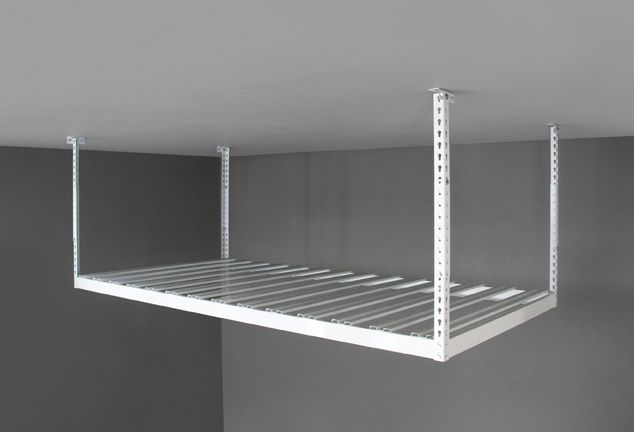 As opposed to a wire mesh, you can easily slide your items on and off the rack when desired with no problems or hangups. They can be ordered with a netting to prevent from 'oversliding' your gear onto the racks. Choose from as small as 24" by 48" or as large as 4 Feet x 8 Feet Long! After that, choose your color - Silver Vein or White. Drop up to 45" from your ceiling. 9 sizes are available to choose! From 24" x 48" all the way to 48" x 96"! Have your new overhead rack professionally installed! $125 per rack. Select Rack Sizes 24" x 48"36" x 48"48" x 48"24" x 72"36" x 72"48" x 72"24" x 96"36" x 96"48" x 96"